One of my New Year’s blogging resolutions was to re-organize a bit. I devote so much of this space to posting about special, timely events that I often neglect writing about the “tried and true,” those mainstay DC attractions that are go-to pursuits for families. They’re mentioned now and then as recommendations for weekday or weekend activities, as well as in round-ups of indoor and outdoor ideas, but it’s not often that one gets a dedicated post with tips and insights garnered from my own adventures with my kids. This is somewhat ironic, since many of those places and activities are our trustiest, things we’ve been experiencing for years and enjoy on a regular basis — you’d think I’d have an overload of rambling posts about them. So, with January nearly over, it’s about time I paid heed to that resolution and began documenting the tried and true as what I’ll call “The Permanent Collection”. And what better way to start than with one of our absolute favorite places, the National Museum of Natural History. Or, as my kids like to call it, the Dinosaur Museum. You can’t talk about the Natural History Museum without mentioning the African elephant exhibit smack in the middle of the grand Rotunda. Even though they’ve seen it countless times, my kids still stand below, mouths agape, as they take in its enormity. They also like to press buttons on a surrounding display panel to hear its wild calls. The lure of this collection in The National Fossil Hall is pretty obvious: What kid isn’t fascinated by the giant skeletal models of prehistoric beasts? And, like most museum exhibits, it gets better for the kids all the time. As Owen has gotten older, he’s become interested in smaller displays, like maps and dioramas that illustrate where different species lived and cases full of real fossils. And we always stop by the FossiLab to watch paleontologists at work through glass walls. (2014 Update: The Dinos are on hiatus for a few years, but you can get paleo fix in the The Last American Dinosaurs exhibit on the 2nd floor. 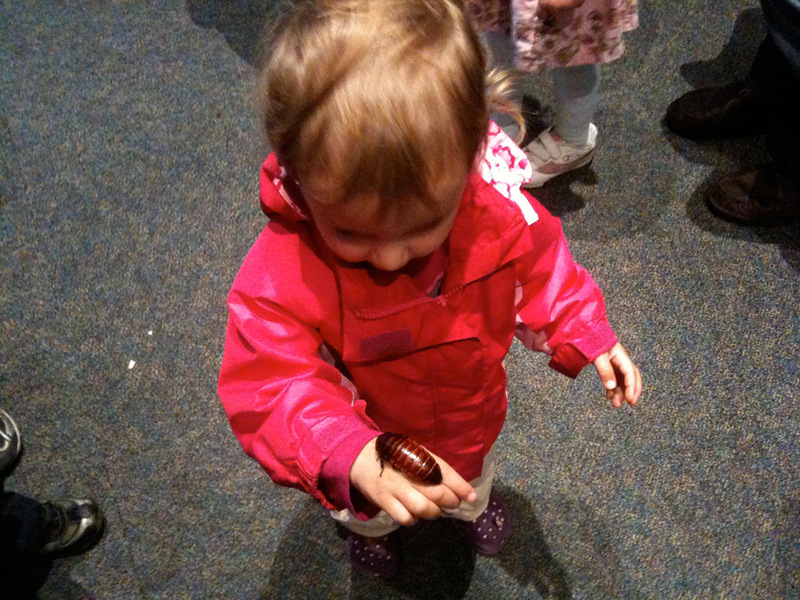 With interactive exhibits, live creatures on display, and opportunities to hold some of them, the Insect Zoo may just be my kids’ favorite part of the museum – both were handling giant caterpillars, cockroaches, and beetles before they could even talk. At various times throughout the day, museum volunteers bring out all kinds of creepy crawlies that guests can view up close and hold. And, depending on timing, you may be able to watch a tarantula feeding, too. For exhibits that aren’t alive, but still fun, kids can check out the “house” in the southwest corner to find out where different insects might make their home in your abode or try to match up bugs with their contributions to the human world on an interactive panel nearby. They can also crawl through a termite tunnel and examine scads of live insect species in terrariums. Right next door, is the Butterfly Pavilion, where guests can walk among nearly 50 different species of butterflies as well as exotic plants. It’s one of the few exhibits that requires a fee — $6/adults, $5/children 2-12, $5.50/seniors. My kids are mesmerized by the aquariums full of colorful fish in the Sant Ocean Hall, underwater scenes projected on the walls, the whale and skeleton suspended overhead, and the giant squid stretched out inside a display case in the center of the hall. Located on the first floor on the opposite side of the Rotunda from the entrance, this exhibit is a must-tour for anyone, young or old, with an interest in oceans and marine life. The Hall of Mammals, a popular exhibit on the main floor, is a very cool showcase of animal species — and masterful taxidermy. The mammals have been preserved so well they look real; even their stances and expressions recall scenes from the jungle, out of the ocean, or off the African plains. Just beyond the wildlife display is a theater where guests can watch a short film about mammal evolution and get a photo op next to the bronze sculpture of Harriet the chimp. Many of the films playing at the Johnson IMAX Theater are perfect for young movie-goers. with interesting subjects relating to nature, relatively short run times (an hour or less), and the 3D aspect of “being there”. See the current schedule here. The interactive and experiential learning space at the Natural History Museum is, in a word, awesome. Visitors can view up close, and in many cases handle, real artifacts and specimens from the museum’s collections. Microscopes let young guests feel like real scientists, and drawers full of everything from animal species to cultural relics are accessible for examination. It’s promoted as a space for teens and tweens, but my younger kids have really enjoyed it, too. Young children can enjoy fun, interesting activities in Q?rius Jr. – a discovery room. They can dress up in costumes from different cultures, examine fossils and minerals up close, do related puzzes, find books, and much more. However, the hours are limited,so be sure to check the schedule as you plan a visit there. While the Gem Gallery isn’t a usual stop for us at the museum — my kids go for the less subtle exhibits right now — I know it’s very popular with many folks, so it’s still worth a mention. And given Sasha’s penchant for sparkly things, it’s likely to become a favorite soon. – The National Museum of Natural History is located at 10th Street & Constitution Avenue NW. The closest Metro station is Smithsonian on the Blue/Orange line. – If you drive, parking is available on nearby streets, or in parking garages across Constitution. – There are two entrances, on the National Mall side and on Constitution Avenue. The latter is stroller-friendly with a ramp and automatic doors. – Admission to the museum is free, but fees are required for the Butterfly Pavilion ($7.50/adult, $6.50/age 2-12, $7/senior) and IMAX movies ($9/ticket). – There is café located on the ground floor that sells sandwiches, salads, coffee and treats. I think it’s funny that we both call it the “dino” museum! Thank you all for the wonderful Kid Friendly Washington DC Museums. the Museum of natural history sounds like a blast! I attending the crime museum last time I visited DC. This go around, I was looking at taking my nephew to some kid friendly locations. so, this information helps out a lot. Thanks!